What is U.S. Career Forum? More than just interviews and seminars! The U.S. Career Forum is a new type of career event for Japanese-English bilinguals interested in changing careers or employment in the U.S. Other than interviews and seminars from participating companies, at the Job Placement area, you’ll have the chance to learn more about job opportunities in the U.S. from several recruiting companies. There is also time to network with company representatives and fellow job seekers during lunch, coffee break, and happy hour. Additionally, one-on-one career advising is available. 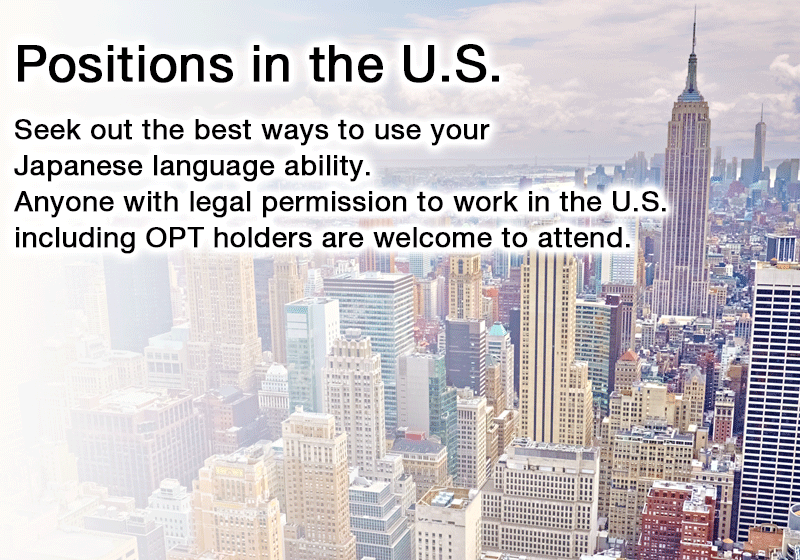 If you have legal permission to work in the U.S, do not miss this opportunity! Some companies will be holding short seminars in the seminar area. No pre-registration required. 1:00PM - 1:20PM SUMITOMO ELECTRIC WIRING SYSTEMS, INC.
For more updated schedule, please check here.